We compare the death of a person with natural phenomena such as rain, snow, storm. It is an endless process, which in the main direction from top to bottom. 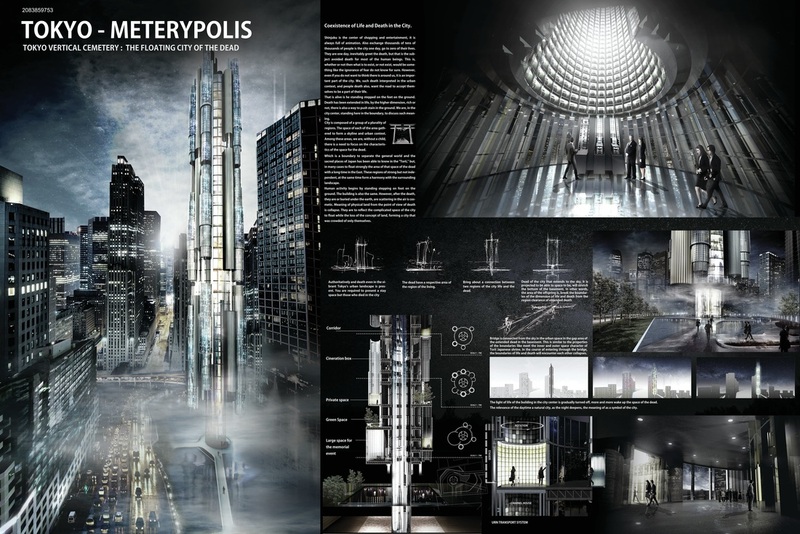 This movement, we would like to display in the architectural design of our vertical cemetery. The façade of our tower is a time varying system. 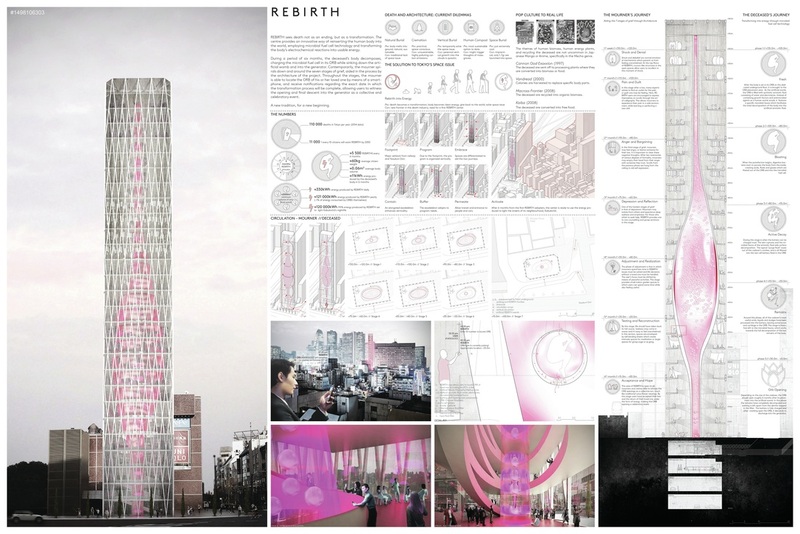 In a different periods of time the drawing of the façade (formed by capsules) whith urnas will be different. 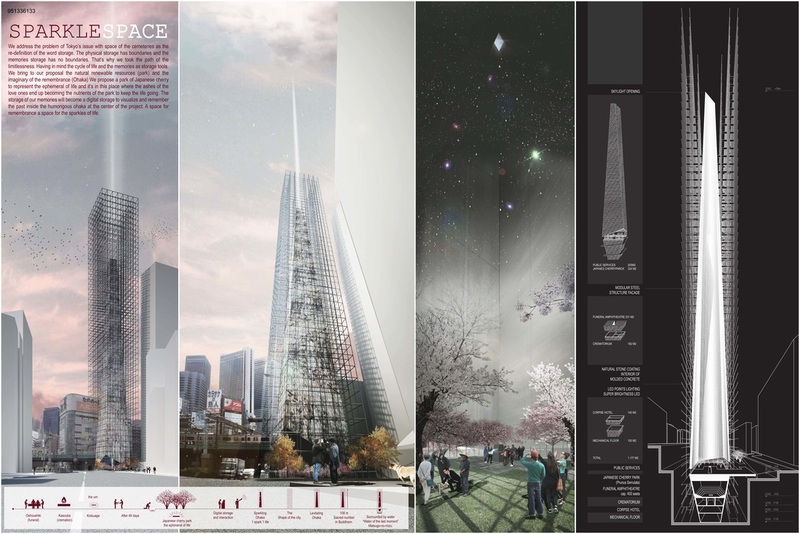 Capsules rises to the top of the tower in the same way as the human soul after death strives upward toward to the sky. Many believe the Japanese culture’s strict guidelines in morals have lead to an excess of release in the form of subcultural outlets. This cemetery celebrates the immoral life we lead, rather than ignore it. Comprised of seven mausoleums, each represents one of the seven deadly sins by architecturally embodying the characteristics of its given sin. Anyone can choose to be forever commemorated in the thousands of urns that line the walls of each mausoleum. Eternally associated with what the deceased chose to live for, his or her loved ones can shamelessly visit and impart on the same sins. In traditional Japanese cemeteries, the dead are buried under stones “haka” this creates a solid place to pray. This tradition is problematic in modern Japan. 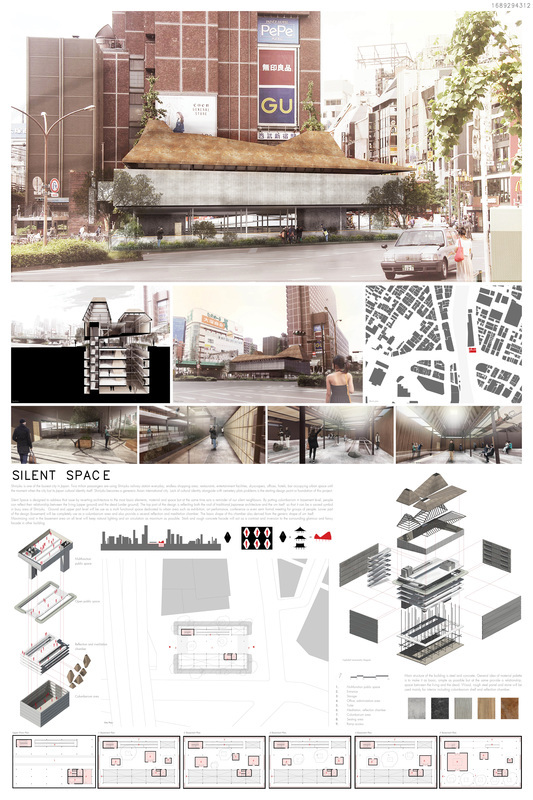 So, with these problems in mind and a need for city dwellers to have an empty, green, contemplative space, the idea evolved to an inmaterial building as a symbol of “death as light” . The columbarium built below ground connected to a fibre optic light, represents the light of the soul; creating an image of ancient mythical burial heightened, through technology to the contemporary. As for the death, they will become a part of the scenario as living plants by means of green burial. For the relatives, visiting the grave changes from a memorial ceremony to recreational activity. People can promenade in the park after the ceremony and also have a meal in the ground level commercial space with each other. It's not only a day for the death, but also for family gathering together. For people like you and me, this park offers cherry blossoms viewing, picnicking, wandering, city viewing and exercising...etc, as a recreational place in the middle of the Shinjuku. For the city, the cemetery will change from a space occupied by the death to a public space that death and life interacting with eachother. The concept is based on a dialogue between volumes made of two drastically different materials and the empty space in the middle. Apart from generating interesting spaces with three different ambiances, this could be considered a metaphor for cemetery, a place between two worlds: dead and living. Our project recognizes them both as different and bonds them together within one structure by finding a place for utilities and public spaces. All this is concealed in modular grid that sorts out space dedicated for each grave in an economic and respectful manner that does not contradict neither Japanese traditions nor customs. Every year in Japan, 32,000 people pass away unclaimed and unknown. No partner, no children, no friends; only the unsigned affiliation to the 'No Relationship Society.' The architecture of death is a cemetery, a decorous glorification to those who can afford it. But how do we broadcast the thousands dying amoungst us without a second thought? This project aims to transcend the normative of death. 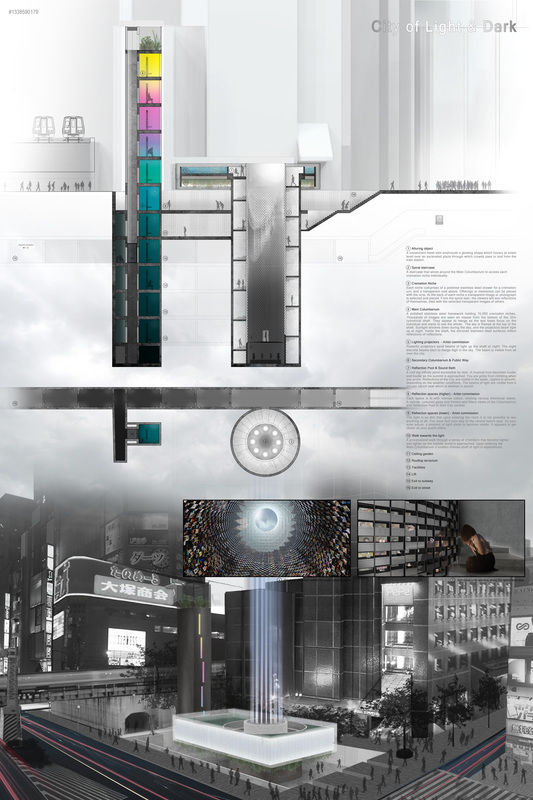 Through an inverted architecture of Tokyo's symbolic broadcast tower, this form advertises the unclaimed masses through a projection delineation of their ashes. Broadcasting live, the death of those with no relationships to an unsuspecting society. Death is absurd. It’s a condition of life and yet the denial of it. The vertical cemetery must convey this paradox. It’s an edifice banal and extraordinary, solid and porous, submitting to the surrounding order and defying it at the same time. Its openings remain unglazed to welcome the breezes. The painful content shouldn’t be concealed. Facing loss and expressing grief should not be silenced. They must be a visible part of the city’s rituals. The building fronts, like the spongy core of bones, evoking both an organic activity and an eroding process, reconcile life with the abyss of death. 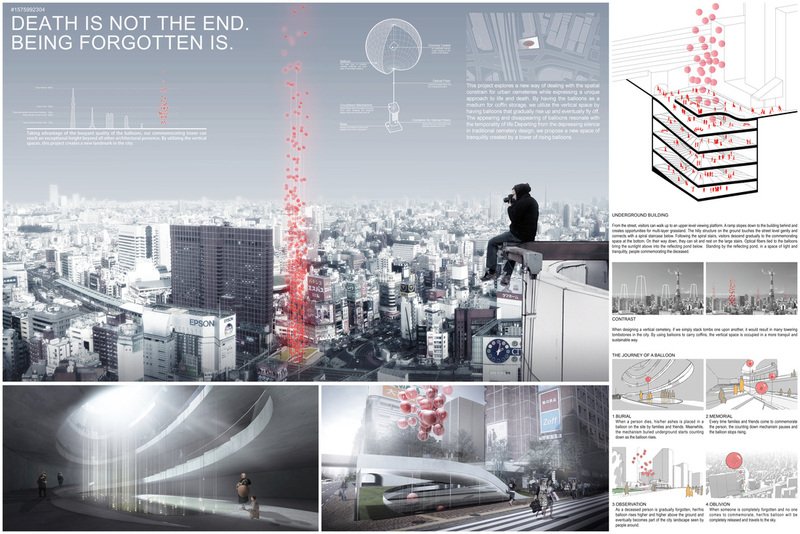 Diamond Futures addresses Tokyo’s burial crisis through a combination of architecture and economics. It harnesses the practice of transforming human remains into diamonds, leveraging both emotional and exchange value to create a building and a system offering space and means to memorialize loved ones. Diamonds signify unity and memory, and in Diamond Futures they become a symbolic and literal core - creating both space and value, they evoke a contemplative atmosphere for individual mourning and collective memory. Additionally, the sale of unused diamonds will fund community programs at sites of former meigi-gashi cemeteries, transforming surrounding neighborhoods into magnets for community growth. 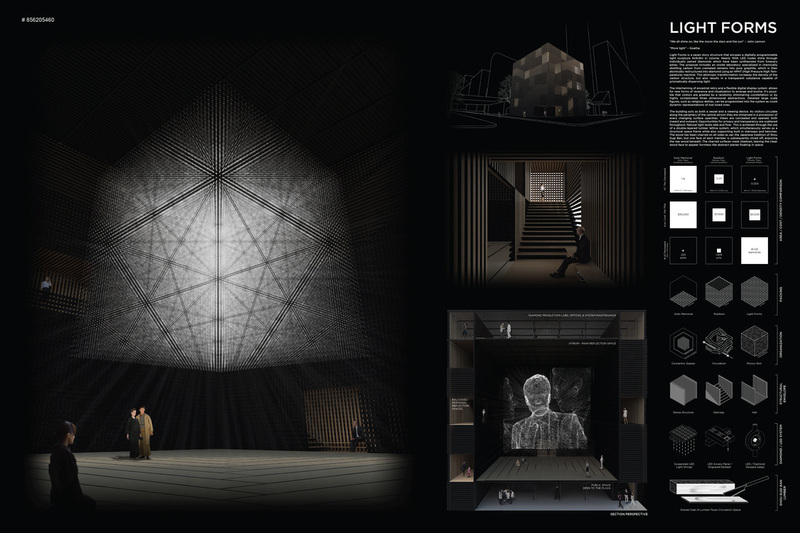 Light Forms is a seven story structure that encases a digitally programmable light sculpture 9x9x9m in volume. Nearly a 100k LED nodes shine prismatically through individually paired diamonds, synthesized from funerary ashes by an onsite laboratory. The intertwining of ancestral relics and a flexible digital display system allows for new forms of reverence and ritualization to emerge and evolve. It’s possible that visitors are greeted by a randomly shimmering constellation or by highly orchestrated three dimensional abstractions. Detailed large scale figures, such as religious deities, can be programmed into the system as could dynamic representations of lost loved ones. Transcendence is a subterranean columbarium rooted in the heart of downtown Tokyo that tempers the morbid perception of death. 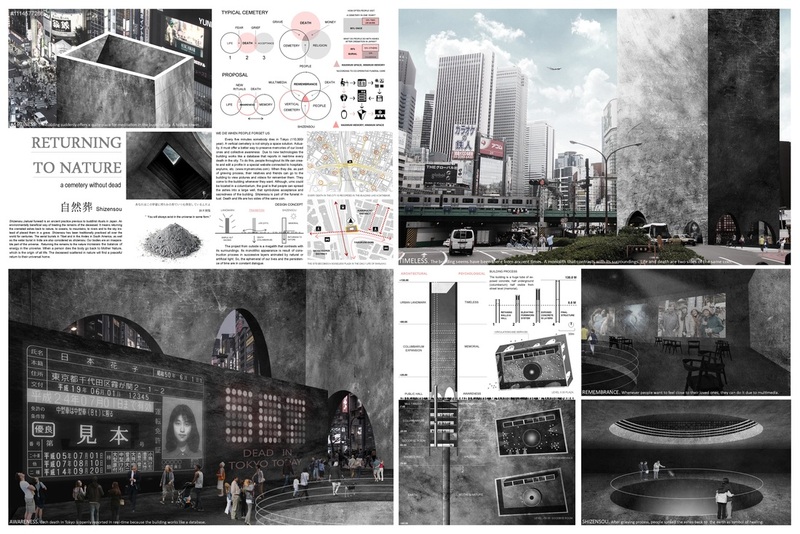 The project memorializes the deceased through the introduction and manipulation of light and nature beneath the city streets. Each of the three reflection zones in the project are designed to provide a distinctly different user experience and interaction with the natural environment. 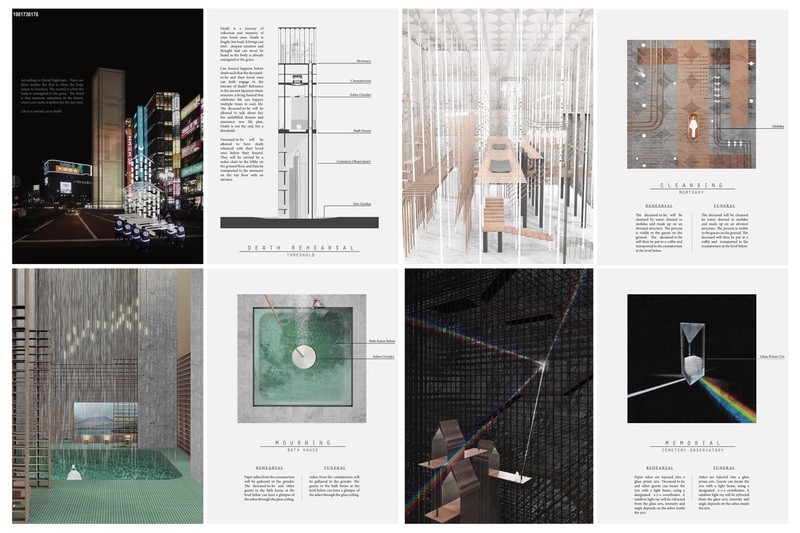 Collectively, the reflection zones all serve to temporarily severe the connection between the user and the city and offer them a respite from reality. Both sound and sight are manipulated to focus the user's attention on self-reflection and meditation. 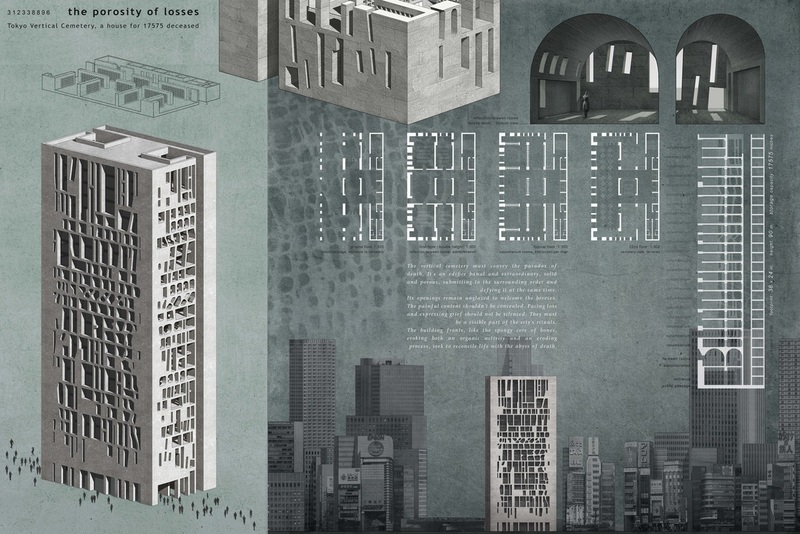 How can one building organize a cemetery on a challenging high density urban setting? 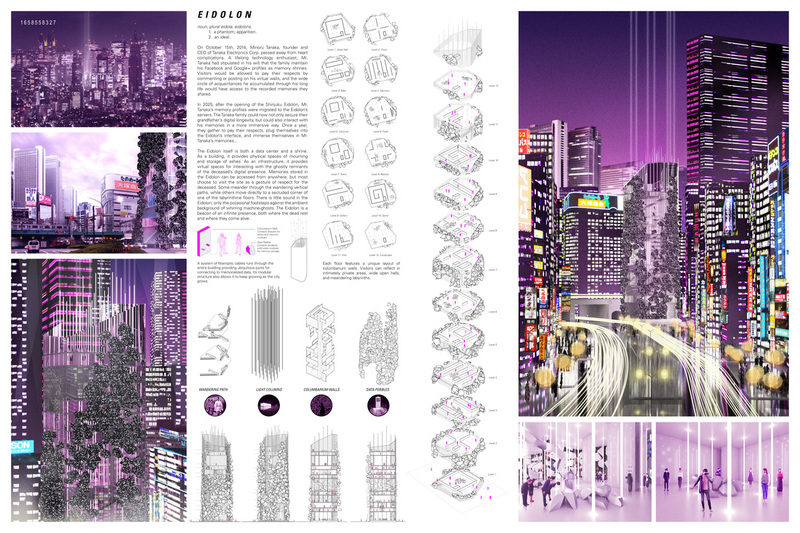 I conceived a raw and simple form that would respond to the challenges of the cityscape. And there is warped void of the courtyard where nature becomes an integrated part of the place for pray like a metaphor of the boundaries of heaven. The corridor surrounding the courtyard is extruded upwards and rotated 90 degrees enclosing the commemorating space to a three-dimensional composition of corridors and bridges. It obstructs the visitor’s vision from the surrounding context isolating them inside of cemetery. In the ever densifying fabric of Tokyo, burial space is rare, sought after, and expensive; justifying Japan’s 99% cremation rate. Within Japanese culture death is understood, not solely as tragedy, but as a culminative celebration of one’s life – a series of rituals preparing the body’s final journey from flesh to ash. 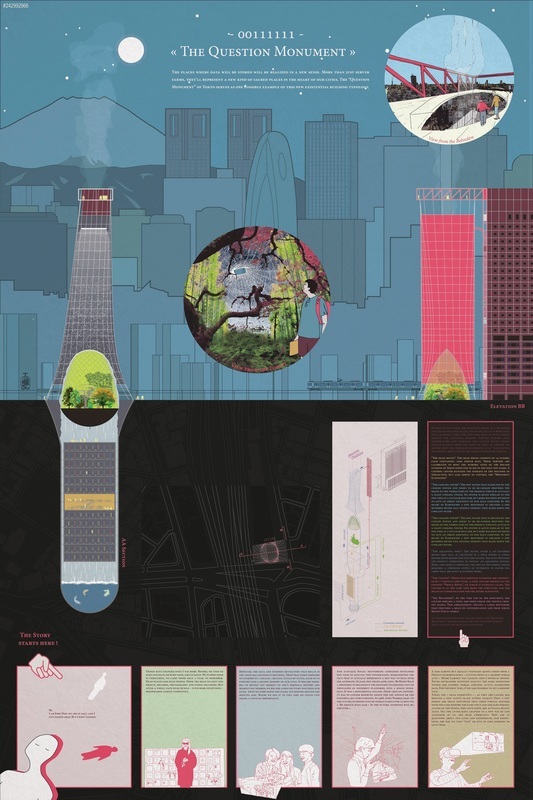 The celebratory continuum should therefore extend from land to air, from static to dynamic and become an everlasting part of city and place. The ash remains are fired into the heavens above, melding with the constant flux of the cosmos. Death becomes spectacle; Tokyo’s gaze, directed to the sky. Tokyo operates in a state of contradiction where the old and new reside together. This is illuminated with MEIGI-GASHI – commercialisation of the sacred; referencing individual pursuit for space in a formidable city. 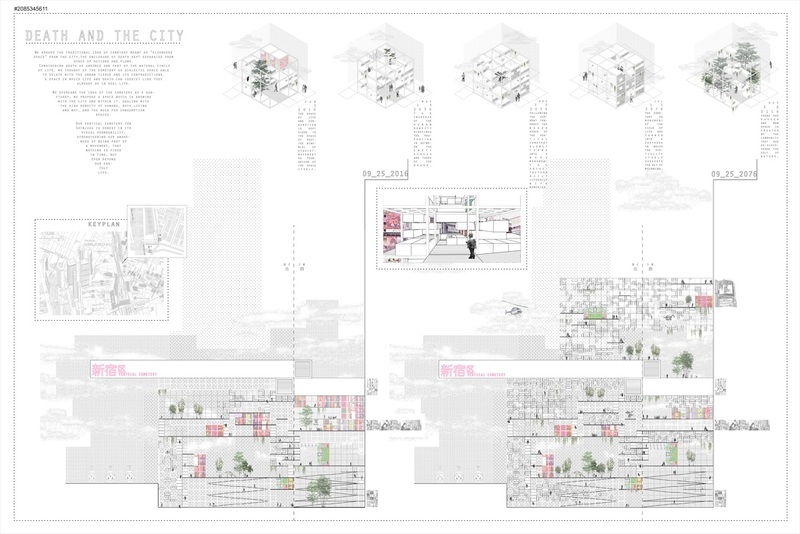 This proposal presents a building block as a vessel for past community members. 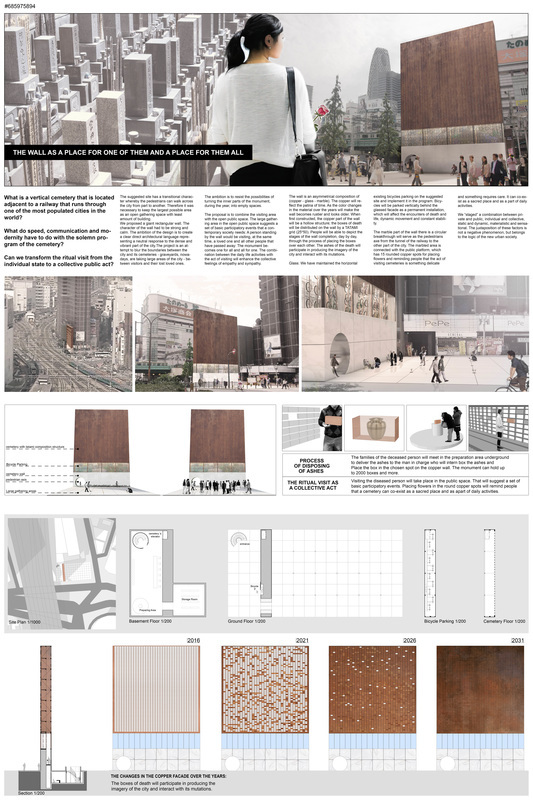 With inscriptions, these wayfinding elements gravitate towards public space; where it is prioritised and abundant. 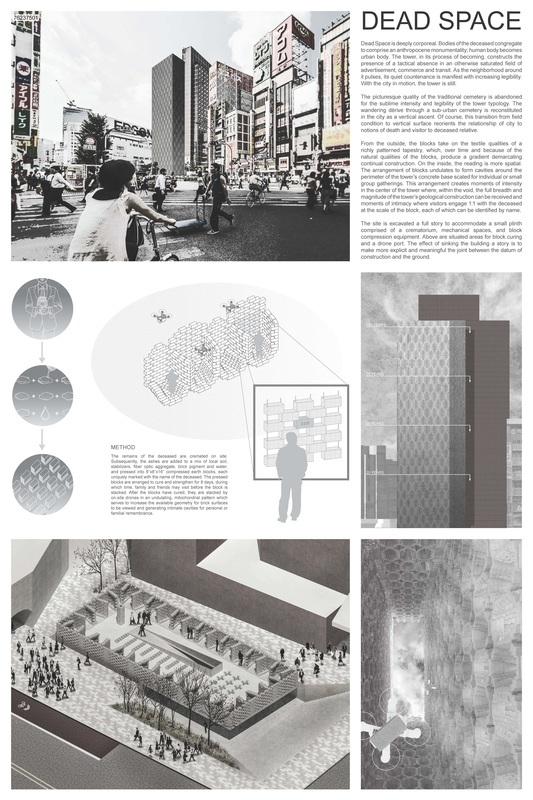 This structure captures the existing duality between the dead and the living; vessels frame enfilades of living spaces above the streets; secure in their own identity as a new form of togetherness for Tokyo City. 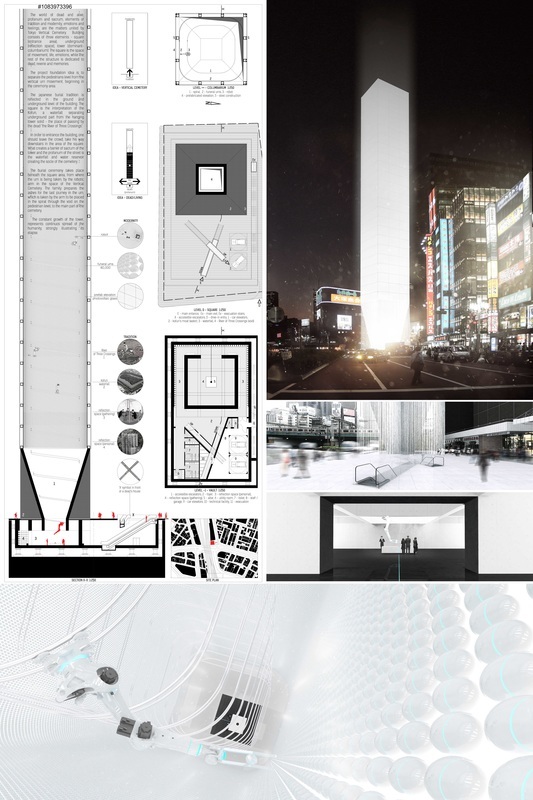 The world of dead and alive, profanum and sacrum, elements of tradition and modernity, emotions and feelings, are the matters united by Tokyo Vertical Cemetery. 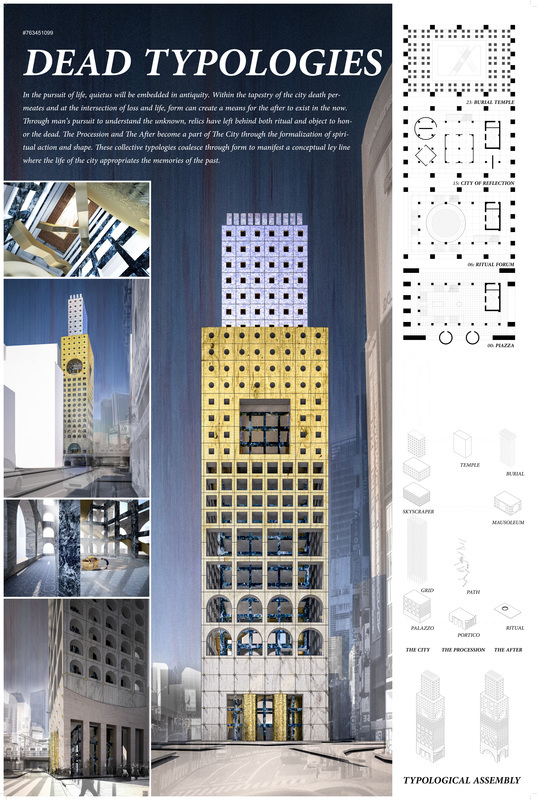 Building consists of three elements - square (entrance area), underground (reflection space), tower (dominant- columbarium). The square is the space of movement, life, emotions, while the rest of the structure is dedicated to dead, reverie and memories. The japanese burial tradition is reflected in the ground and underground level of the building, while the tower illustrates constant growth - the modernity. Bring about a connection between two regions of the city life and the dead. 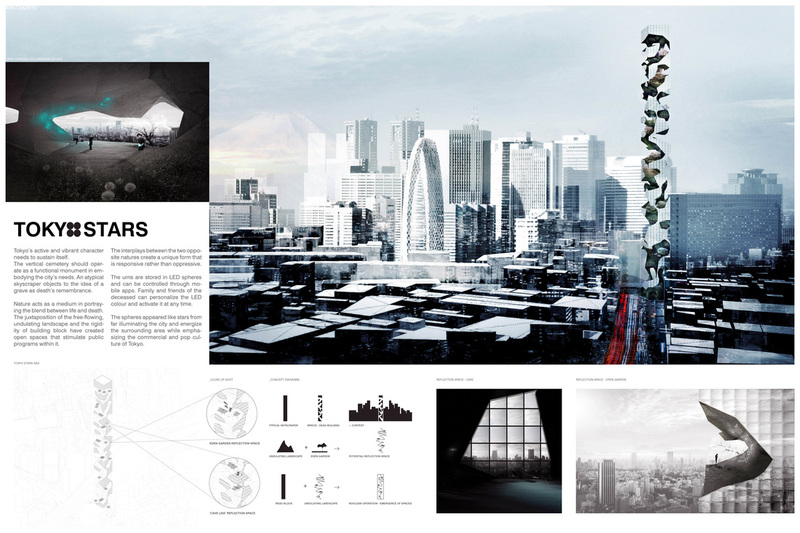 Dead of the city that extends to the sky, it is projected to be able to space to be, will stretch the bottom of the basement. In other words, the area of the offspring is, break the boundaries of the dimension of life and death from the region clearance of extended death. This is similar to the properties of the boundaries like connect the inner and outer space character of Torii Japanese shrine. Through the bridge, the boundaries of life and death will encounter each other collapse. The light of the building in the city center is gradually turned off, more and more wake up the space of the dead. The relevance of the daytime a natural city, as the night deepens, the meaning of as a symbol of the city. Relationships between OLD and NEW, LIFE and DEATH, HEAVEN and EARTH, PAST and FUTURE were expressed both morphologically and programmatically. We have combined the facade typologies from both west and east to dissolve the cemetery between them. To create an intermediate space connecting the life and death, while disconnecting the living and dead, the glass box helps define the boundary. Strengthening the spatial experience for the cemetery visitors, a bottomup circulation system is to mimic the linkage from earth to heaven. In prime essence, the plugin system allows REGENERATION of the cemetery. At the same time, the decomposable urn in addition of the tree burial system, REUSE of urn space facilitate its sustainability as years pass. DEATH IS NOT THE END. BEING FORGOTTEN IS. 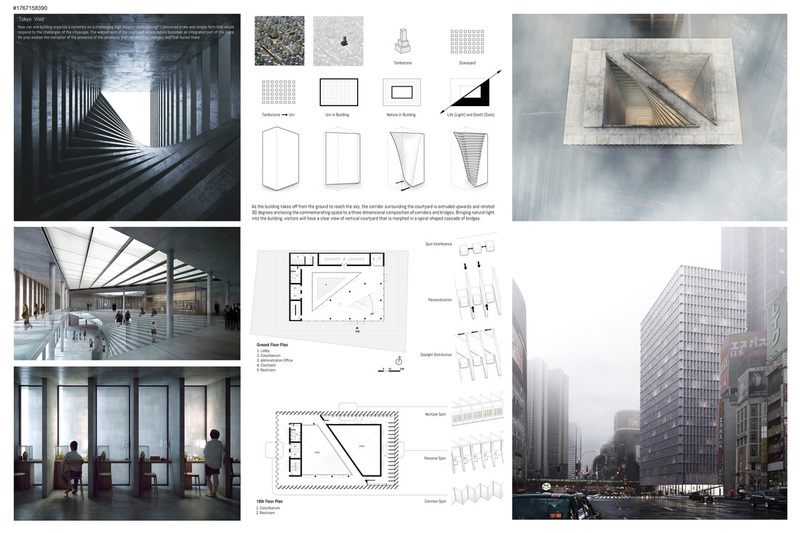 This project explores a new way of dealing with the spatial constrain for urban cemeteries while expressing a unique approach to life and death. By having the balloons as a medium for coffin storage, we utilize the vertical space by having balloons that gradually rise up and eventually fly off. The appearing and disappearing of balloons resonate with the temporality of life. Departing from the depressing silence in traditional cemetery design, we propose a new space of tranquility created by a tower of rising balloons. Time is limited but Memories are not. ​We suggest permanent spiritual memory space with digital technology to next generation. Funeral urns will be changed as “memorial cube” combined physical ashes(material) with spiritual memories(essence) through informatization process. It will shows memories of the deceased as hologram and multimedia that connect city and cemetery. 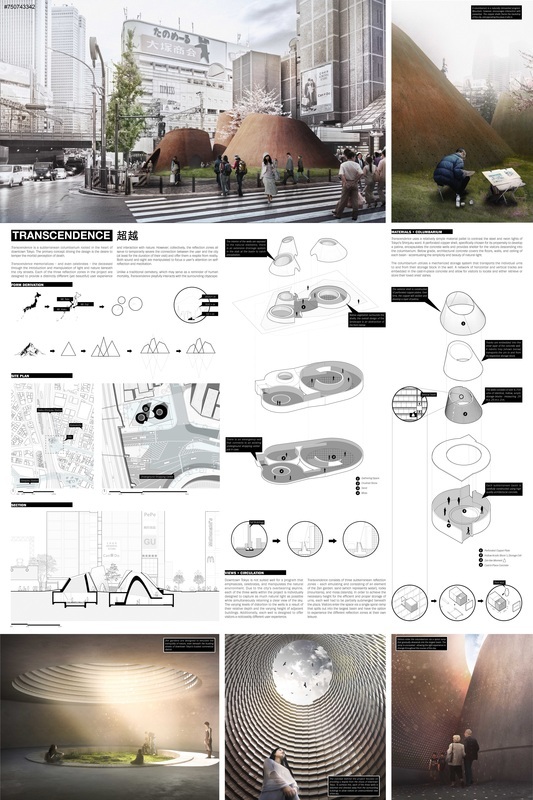 To short, cemetery become dematerialization that doesn’t need physical space anymore. Eidolon is a specter. A shrine. A pile of rocks. A labyrinth. A skyscraper. A data farm. It is the last vestige of our digitization process: the digitization of death. As death becomes data (and metadata), identities and memories are stored here in physical, semi-physical, and virtual bits in the heart of a bustling mediatic city. 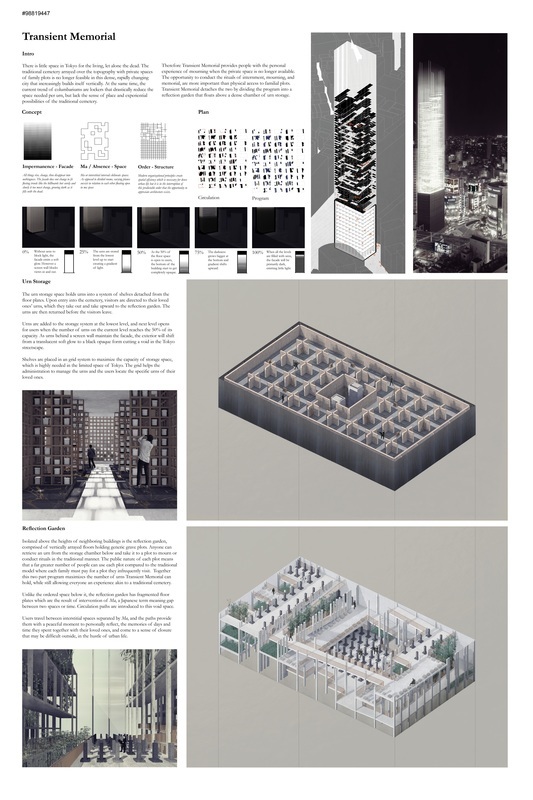 It grows taller as the city densifies, and more introverted as the virtual world expands. Eidolon is a beacon of infinite presence in an increasingly immaterial world where realities are blurred and ghosts roam free in the machine. The design approach is merging the spiritual part of the traditional funeral with the practicality of the modern way. This is conveyed through the ritualistic symbolic modernized program. In order to make an intimate visual connection between the live city and death; a flip is in order. The project’s vital parts (Wake, Funeral and Cremation) will be rooted under the soil turning the entire entity upside down. The ashes will stay in the erected urned columns for seven days, until transferred into the roots of the centered Bodhi tree to help the human spirit reach Buddhahood. 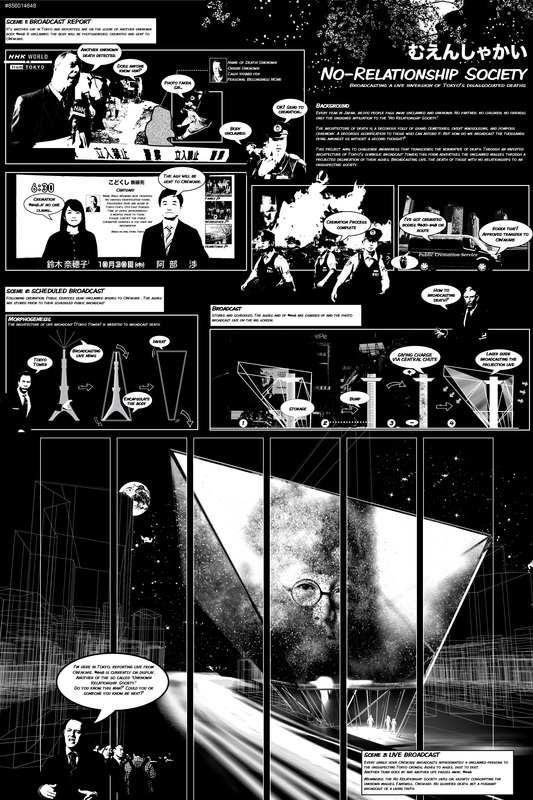 Inner Landscape is a boundary between the frantic rhythm of the city and the timeless interior space. 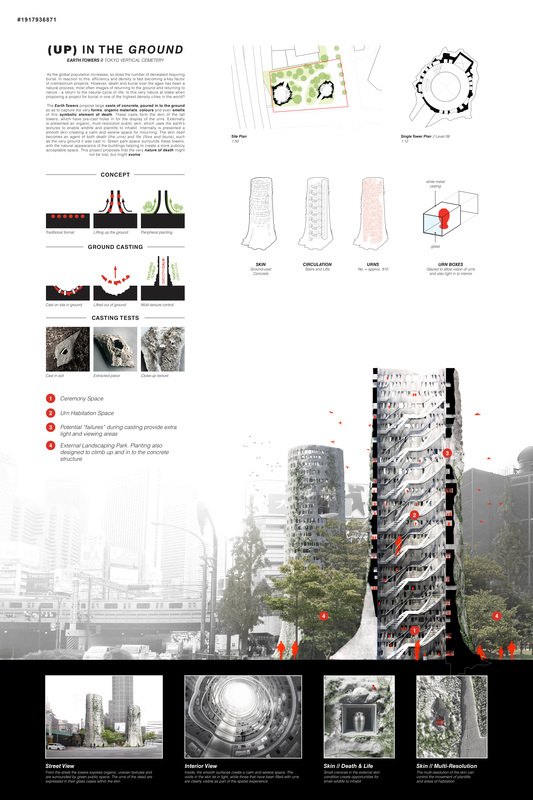 Inner Landscape is a vertical path, hybrid interpretation of multi-storied pagoda and Japanese shrine. Inner Landscape symbolizes the Buddhist tripartition into three lands: a land of roots, a land of the middle and a plain of high heaven. ​Inner Landscape is death and life: a cryptic place to feel close with loved departed and a spiritual route between "artificial" pieces of Japanese landscape, that leads to the perception of the Shinto's reverence for natural artifacts. In the pursuit of life, quietus will be embedded in antiquity. Within the tapestry of the city death permeates and at the intersection of loss and life, form can create a means for the after to exist in the now. Through man’s pursuit to understand the unknown, relics have left behind both ritual and object to honor the dead. The Procession and The After become a part of The City through the formalization of spiritual action and shape. 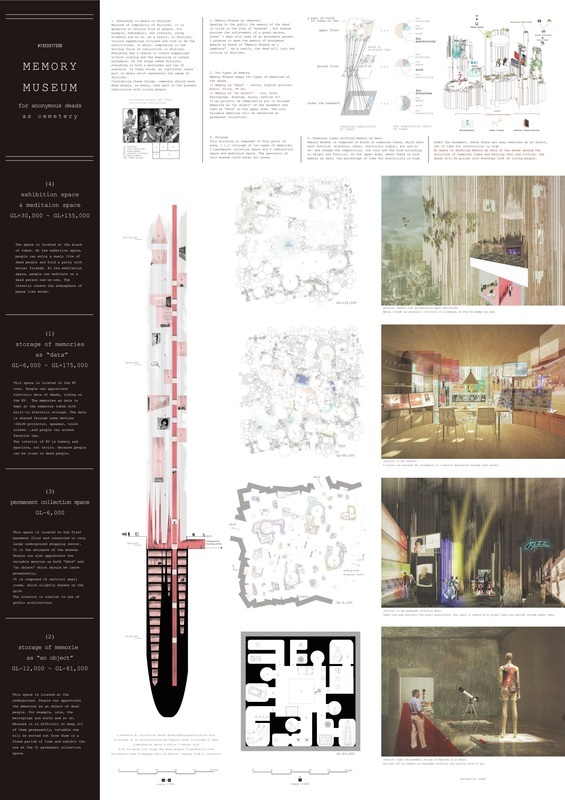 These collective typologies coalesce through form to manifest a conceptual ley line where the life of the city appropriates the memories of the past. Located in the city of Tokyo, Shinjuku is a place where the relationship between the living and the dead often goes forgotten. 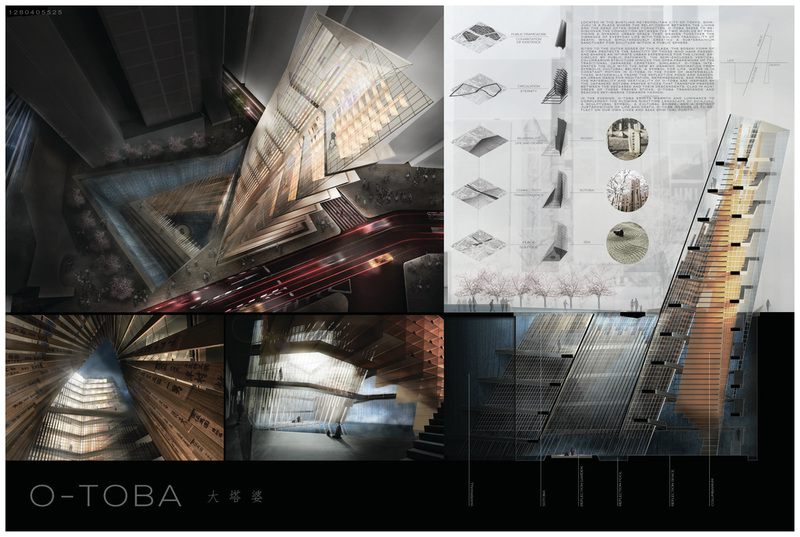 O-TOBA seeks to rediscover the connection between the two by providing a dynamic urban space that weaves the vibrance of life with the solemn tranquility of death, while simultaneously creating a sanctuary for solitude within a public sphere. Clad in hundreds of Japanese prayer sticks, O-TOBA transcends and reaches sky-wards towards heaven. A sculptural symbol, a cultural bridge. O-TOBA inspires us to reflect on our own lives and seek spiritual purity. The Earth Towers propose large casts of concrete, poured in to the ground so as to capture the very forms, organic materials and smells of this symbolic element of death. These casts form the skin of the tall towers, which have pre-cast holes in for the display of the urns. Externally is presented an organic public skin, which uses the earth’s textures to enable wildlife and plantlife to inhabit. Internally is a smooth skin creating a serene space. Green park space surrounds these towers, the natural appearance of the building helping to create a more publicly acceptable space. REBIRTH sees death not as an ending, but as a transformation. The centre provides an innovative way of reinserting the body into the world, employing microbial fuel cell technology and transforming the body’s electrochemical reactions into energy. During six months, the deceased’s body charges the ORB’s battery while sinking down the artificial womb. Contemporarily, the mourner spirals down the seven stages of grief, aided by the project’s architecture. Users may locate the ORB of a loved one through their smartphones, allowing them to witness the opening and descent of the ORB into the generator as a collective and celebratory event. The places where the datas will be stored will take a new sense. 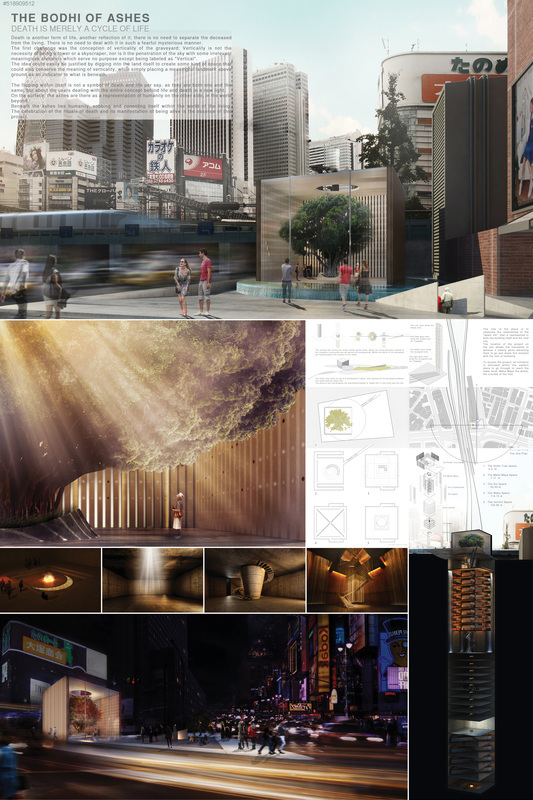 More than server farms, they'll represent a new kind of sacred places in the heart of our cities. 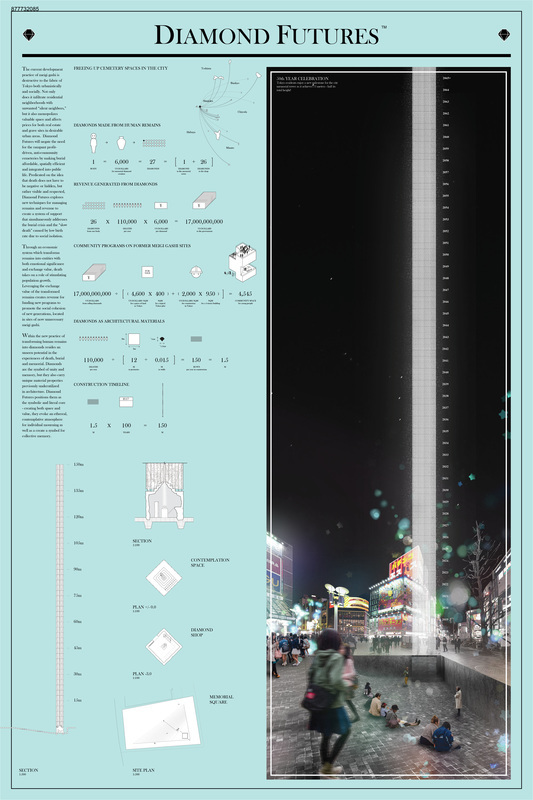 The "Question Monument" of Tokyo, could be one possible result of this new existing buildings. At the junction of air and soil, it's the materialization of the new interdependency which can exist between life and death. of human life, death and architecture become one. 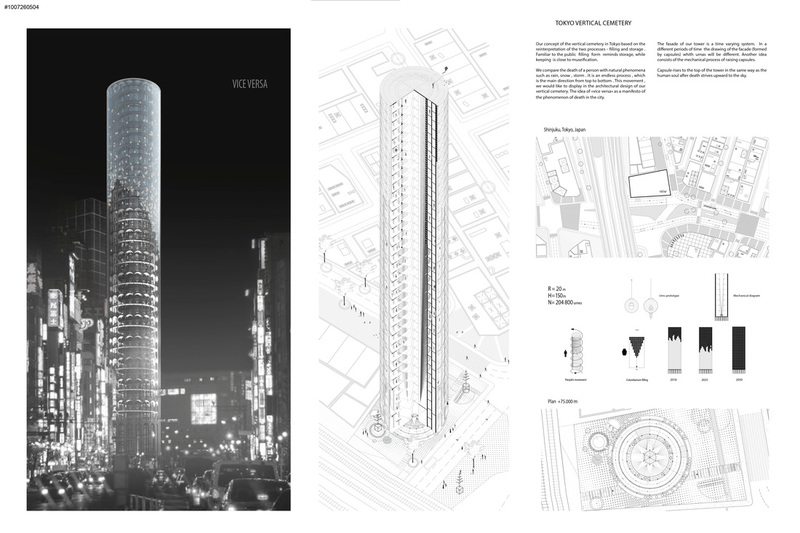 While maintaining a basic shape, the tower remains an noticeable and distinct accent in the city’s landscape. With the exterior covered with flashing digital advertisements, the building becomes invisible, blending into the rest of the city. Beneath that generic surface lies the kingdom of the dead. The strong contrast invokes deep reflection about life and helps familiarise the concept of death. The interior consists of a cloudlike steel construction. 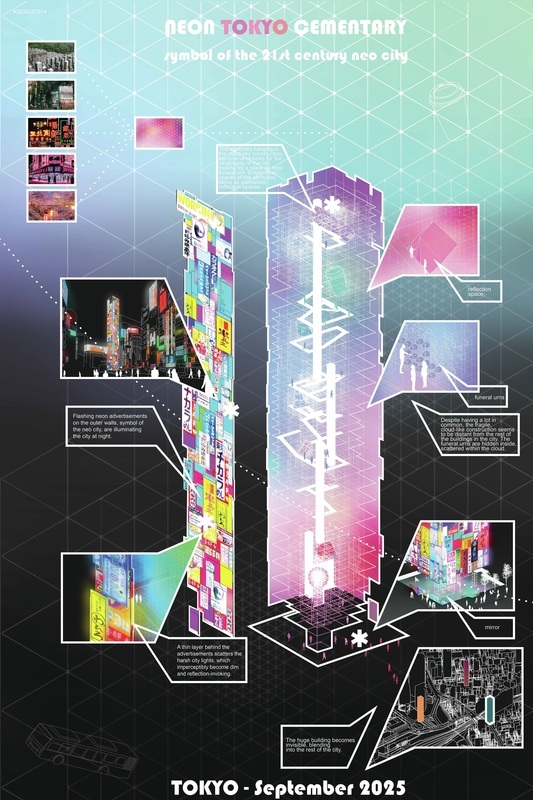 The surreality of the design is underlined by dim, colourful light emitted by the advertisements on the exterior. Within the construction lie scattered attributes symbolising different lifestyles and personalities. BEYOND THE HORIZON OF CONSCIOUSNESS questions about our current concept of the consciousness and its relation to death. 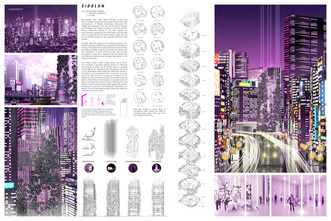 The project is an ‘uncanny' negation of Tokyo - the city which floods every ‘dark space’ with light and noise, the city that leads to shatter myth and irrationality. 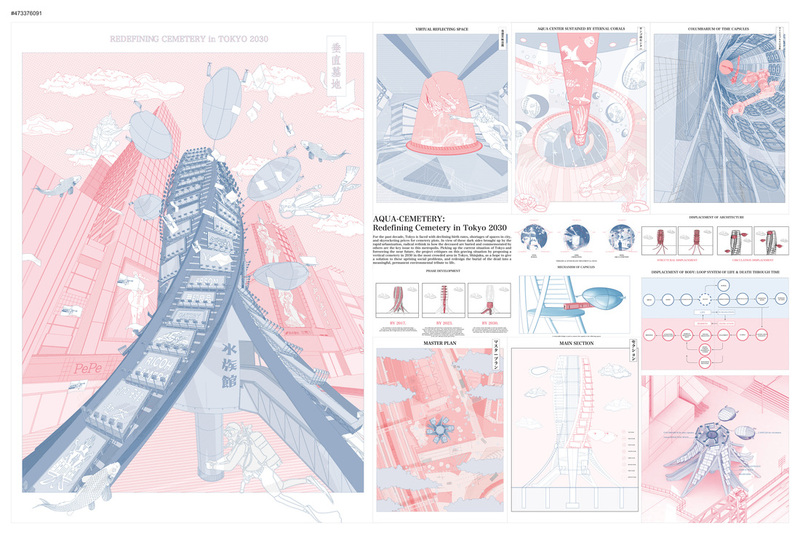 Space express itself through mimicry of cave, architecture that doesn’t have a plan or rooms. The site is a meadow interacting with users. The surface of rocks serves as a columbarium, a storage for modern ‘urns’ created from the separation of DNA. The bottom of cave consists of a main reflection space. Smaller, personal ones are located all the way from entrance to lake. The urbicultures of Shinjuku are driven by anonymous people. Opening to the public the memory of the dead is tried in the form of "a museum". But a museum deals with only a great person, not an anonymous person. 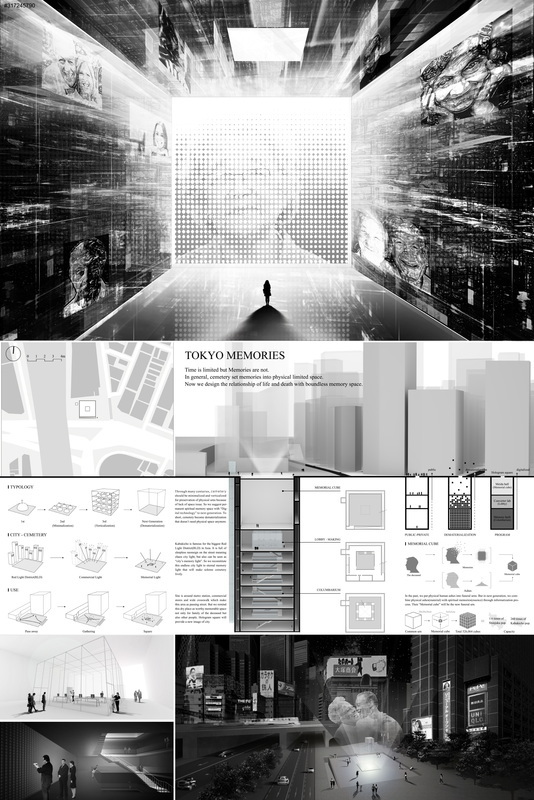 I propose to open the memory of anonymous people by means of "Memory Museum as a cemetery". As a result, the dead will join the culture of Shinjuku. In my project, we temporarily put in storage memories as "an object" under the basement and ones as "data" on the upper area. The only valuable memories will be exhibited as permanent collection. 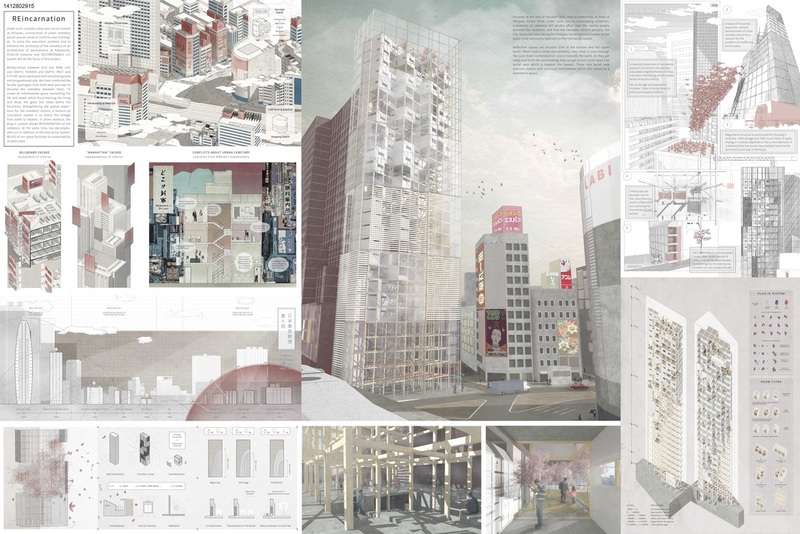 This project is an attempt at a realistic architectural response to the strange dialogue between the entrenched symbols of death, especially within Japan, and the brusque commercial fabric of the site. Like the in rest of Asia, many seemingly contrasting object can exist side by side, oblivious or accustomed to each other. 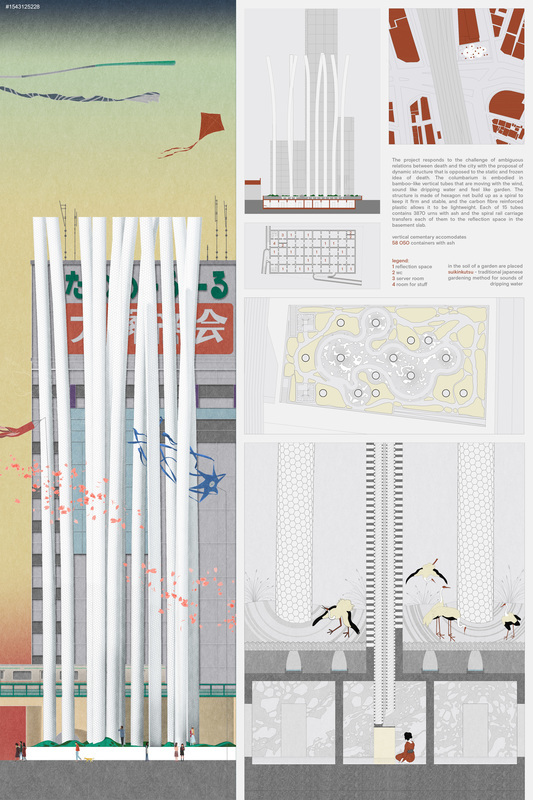 Nevertheless, symbols of death are extremely taboo and sensitive within the Sinosphere, hence the appropriate response is critical in the conceptualization of such a building and its effect or non-effect to its surroundings. 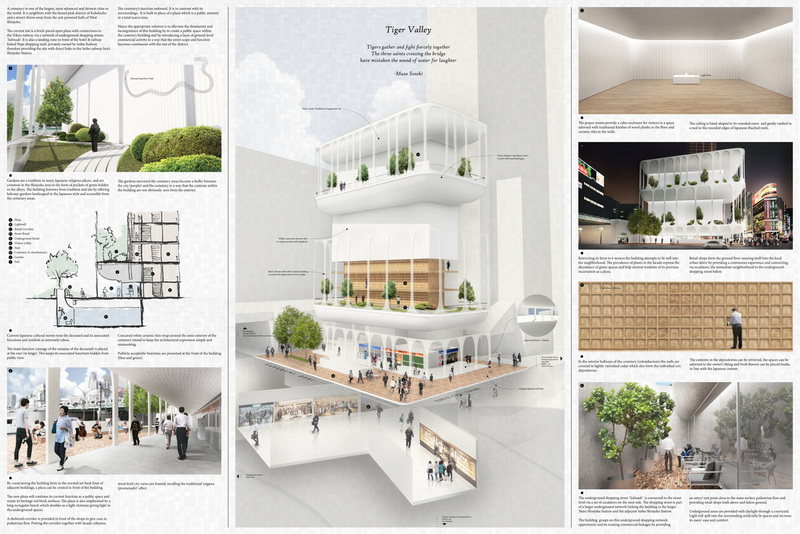 How to create a cemetery that reflects a life we are living in the urban and densed Shinjuku? Project consists of modular prefabricated columns with niches and automated delivery system. Urns are personalized and can be chosen in vending machines (columns). The ceremony of filling urns with ashes is carried privately on the ground floor at altars. Each column stands as a singular columbarium with its own reflection space. 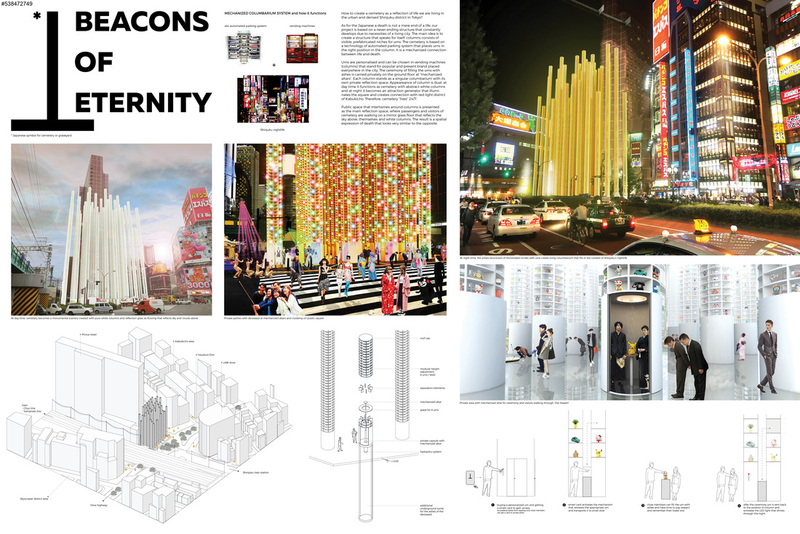 During the day it functions as cemetery with white columns and at night becomes a beacon that illuminates the square and creates a connection with Shinjuku's nightlife - cemetery lives 24/7. Among the lights of Tokyo, there are some which rise toward the sky, detaching from the chaos of the city. They are the ones of the GGT, a landmark for the city, permeable to the metropolitan fluxes, which will grow together with the growth of the population. The lifts moving along the facade are inhabitable spaces: here you can drink tea, buy flowers and meditate during the time of the ascension toward the columbarium. The spherical lift brings the deceased and his beloved in the progressive detachment from the Earth, making the experience of the burial a unique moment. 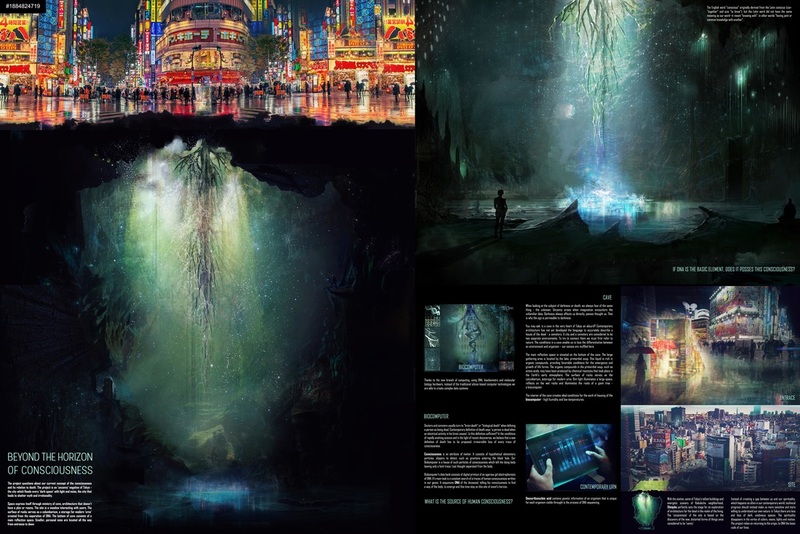 In the centre of fast paced, high energy Tokyo, City of Light and Dark is a place to reflect upon those who are no longer alive, as well as to contemplate the very nature of life and death. 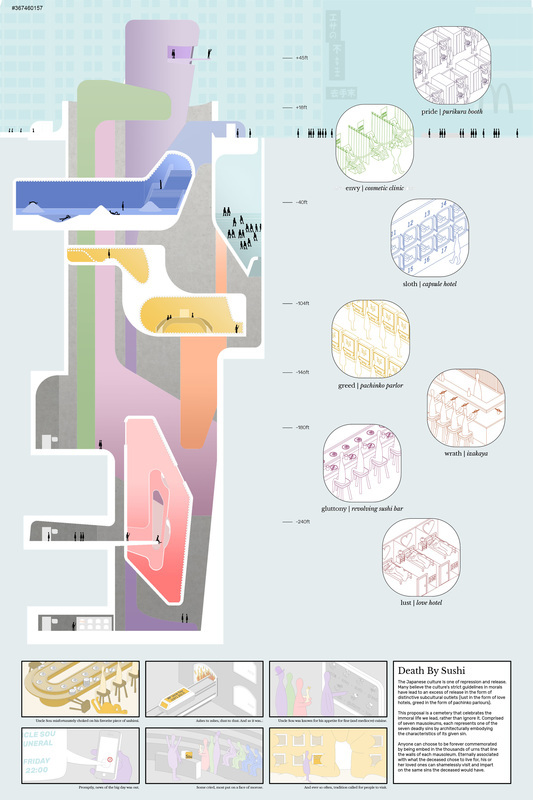 The columbarium is a 32m cylinder containing 15,000 cremation niches. During the day, light streams down the shaft. At night powerful beams of light are projected kilometres into the sky. Reflection spaces reduce and declutter sensory information to intensify the experience of our inner world. Awareness of being located in the immediate city and the greater universe is maintained to varying degrees. When trying to tackle the issue of burial facilities in Tokyo's dense and highly speculative urban environment, we feel compelled to wonder about the scope of this problem on a global level and it is fair to say that burial practices have always been closely linked not only to religious beliefs and dogma but also to social and economic context. 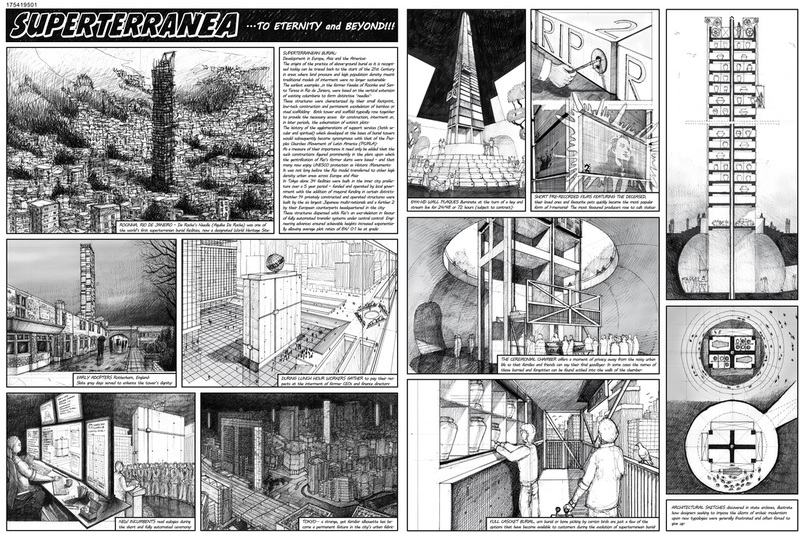 ​Our entry consists of a fictional graphic narrative describing the recent history of the world's most popular type of burial facility at the beginning of the 23rd century - a time when funerary practices have become more pragmatic and the interaction between people and their dearly departed's remains has changed. Tokyo’s vertical cemetery welcomes people to visit their dearly departed in their own personal way. The building houses an infrastructure that allows the visitors to retrieve the ashes of the deceased and venture to a floor that suits their interests. When the visit is over, the urn is returned to the columbarium below ground, which can be studied through the public glass plaza in front of the cemetery. During a cremation the front façade of the cemetery displays the smoke, briefly filtering the view on each visitation floor before vanishing into the sky. For the past decade, Tokyo is faced with declining birth rates, shortages of spaces in city, and skyrocketing prices for cemetery plots. In view of these dark sides brought up by the rapid urbanization, radical rethink in how the deceased are buried and commemorated by others are the key issue to this metropolis. 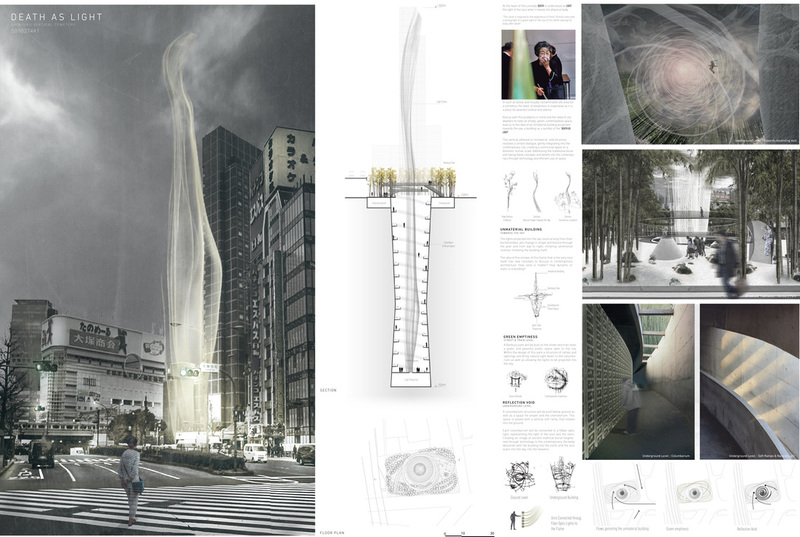 Picking up the current situation of Tokyo and foreseeing the near future, the project critiques on this graving situation by proposing a vertical cemetery in 2030 in the most crowded area in Tokyo, Shinjuku, as a hope to give a solution to these uprising social problems, and redesign the burial of the dead into a meaningful, permanent environmental tribute to life. Dead Space is deeply corporeal. 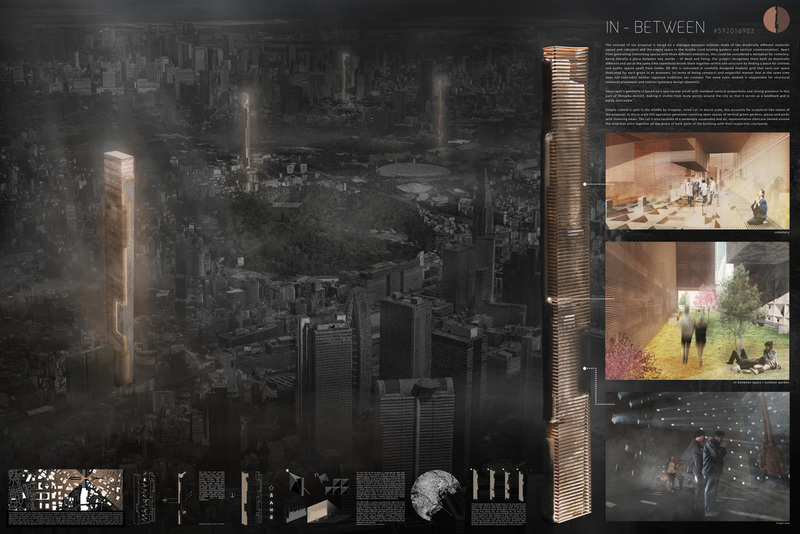 Bodies of the deceased congregate to comprise an anthropocene monumentality; human body becomes urban body. The tower, in its process of becoming, constructs the presence of a tactical absence in an otherwise saturated field of advertisement, commerce and transit. As the neighborhood around it pulses, its quiet countenance is manifest with increasing legibility. With the city in motion, the tower is still. We argued the traditional idea of cemetery meant as “elsewhere space” from the city,the enclosure of death kept separated from space of actions and flows. Considering death as absence and part of the natural circle of life, we thought of the cemetery as dialectic space able to relate with the urban tissue and its contradictions, a space in which life and death can coexist like they already do in real life. 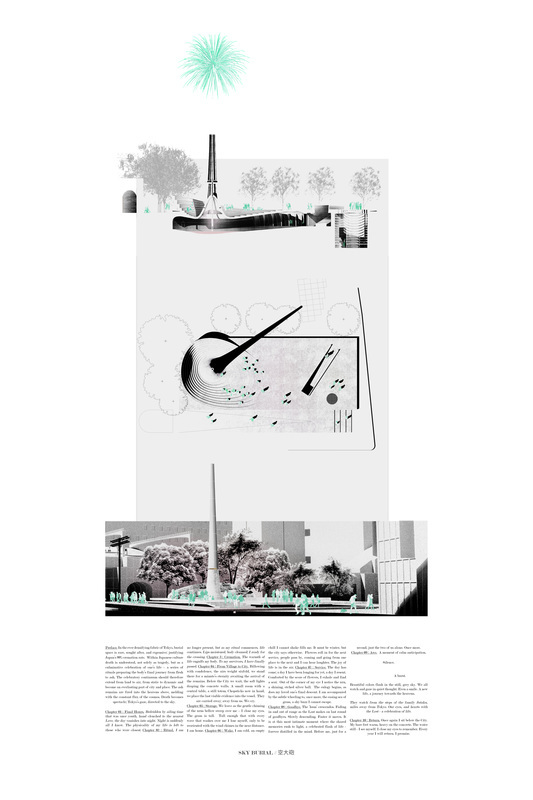 We overcame the idea of the cemetery as a sanctuary, we propose a space which is growing with the city and within it, dealing with the high density of humans, both living and not, and the need for consumption spaces. 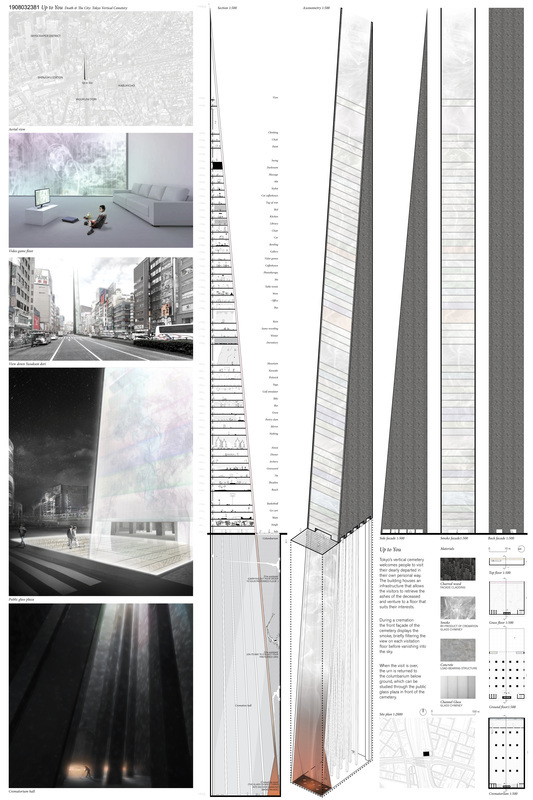 Our vertical cemetery for Shinjuku is honest in its visual permeability, strengthening our awareness of being part of a movement, that nothing is fixed in time, not even beyond our earthly life. 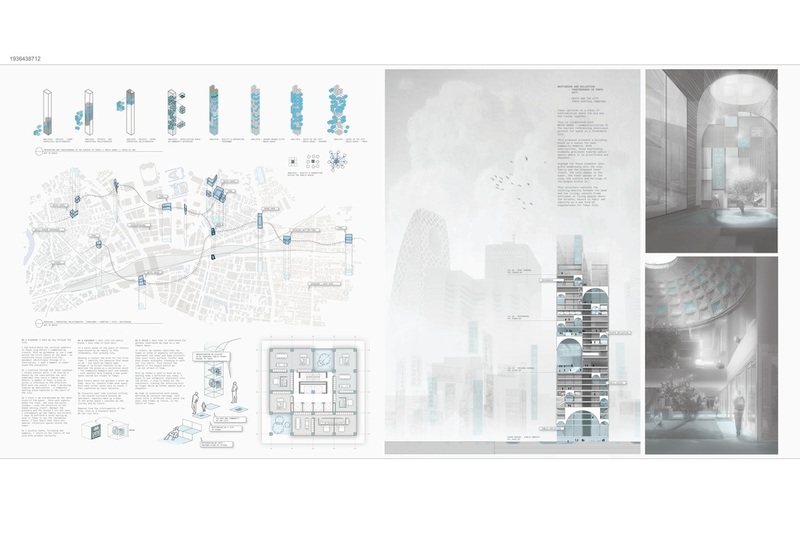 The ambition of the design is to blur the boundaries between the city and its cemeteries, between visitors and their lost. We “staged” a combination between private and public, individual and collective, static and dynamic. We suggested a wall built on the minimum possible area in a way that will help to keep most of the site as an open gathering space. Generating the ritual visit from below will help to transform it into a collective public act. It is an attempt to resist the possibilities of turning the inner parts of the monument, during the year, into empty spaces. We address the problem by re-defining the word storage and finding elements without boundaries. Like nature and memories. We bring to our proposal natural renewable resources (park) and the imaginary of the remembrance (ohaka) Proposing a park of Japanese cherry to represent the ephemeral of life and it’s in this place where the ashes of the love ones end up becoming the nutrients of the park to keep the life going. The storage of our memories will become a digital storage to visualize the past inside a sparkling humongous ohaka at the center of the project. The Transient Memorial provides the personal experience of mourning when the private space of the plot is no longer practical, by dividing storage and reflection. The urns are stored in a system at the bottom of the building. Urns are added to the bottom level and move up the façade. From the street level, the building will grow dark as the years pass. Visitors take urns from there up to a reflection garden and generic grave plots to gather to mourn and reflect. 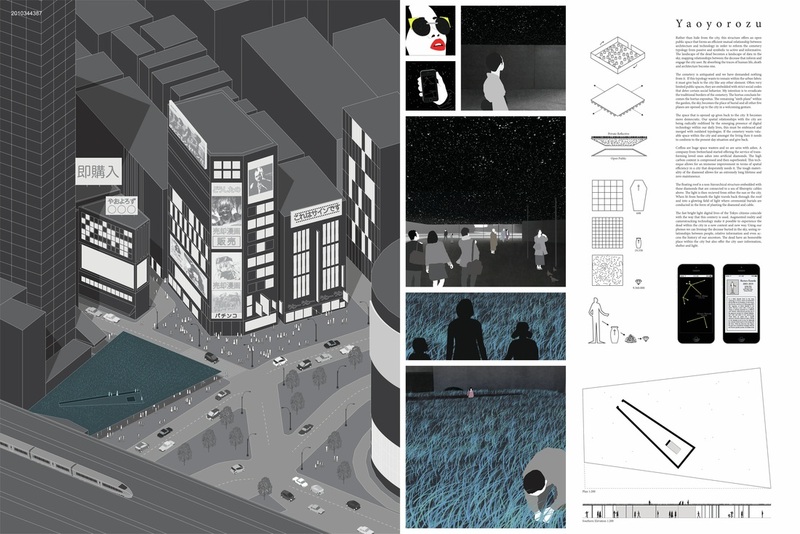 The spaces vary in density and create a new topography allowing people to mourn in whichever manner they want. The cemetery is more infrastructural object rather than an urban attractor, thus this monumental object is visually unapproachable. This foreign four-wall-shape is inserted into complex city fabric, but its connection with the environment is made by the portal, formed by the walls cut and public garden in the yard. The mass is filled with various “rooms” - modular cells, that create completely private space for each urn, also funeral urns can be stored in a columbarium, or below ground. Consequently, this array of private rooms, placed in the semi-private space should provide a comfortable atmosphere for contact with the deceased. Shinjuku becomes a genereric Asian international city. Lack of cultural identity alongside with cemetery plots problems is the starting design point or foundation of this project. Silent Space is designed to address that issue by reverting architecture to the most basic elements, material and space but at the same time acts a reminder of our silent neighbours. By putting columbarium in basement level, people can reflect their relationship between the living (upper ground) and the dead (under ground). The top part of the design is reflecting both the roof of traditional Japanese architecture and the urn itself so that it can be a sacred symbol in busy area of Shinjuku. Tokyo’s active and vibrant character needs to sustain itself. 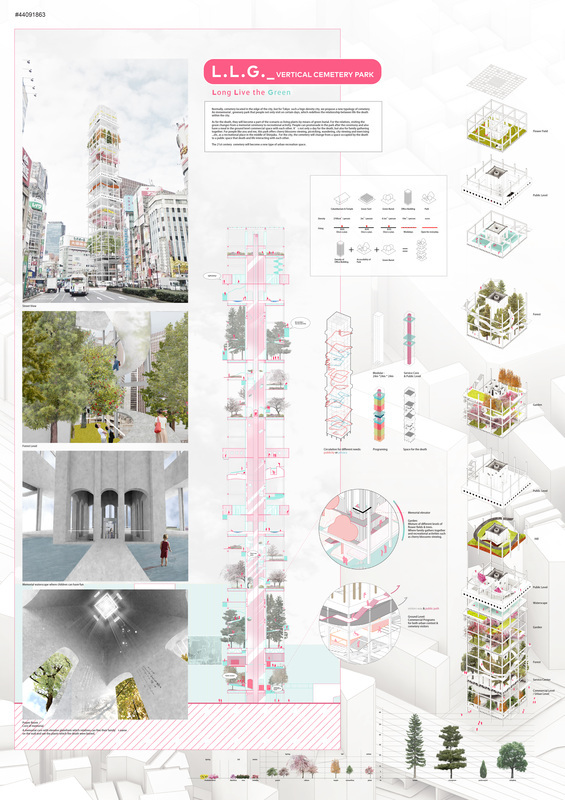 The vertical cemetery should operate as a functional monument in embodying the city’s needs. The juxtaposition of the free-flowing, undulating landscape and the rigidity of building block have created open spaces that stimulate public programs within it. The interplays between the two opposite natures create a unique form that is responsive rather than oppressive. The urns are stored in LED spheres and can be controlled through mobile apps. The spheres appeared like stars from far illuminating the city and energize the surrounding area while emphasizing the commercial and pop culture of Tokyo. Within the world’s largest metropolis, the need for an efficient and respectful cemetery typology is severe. 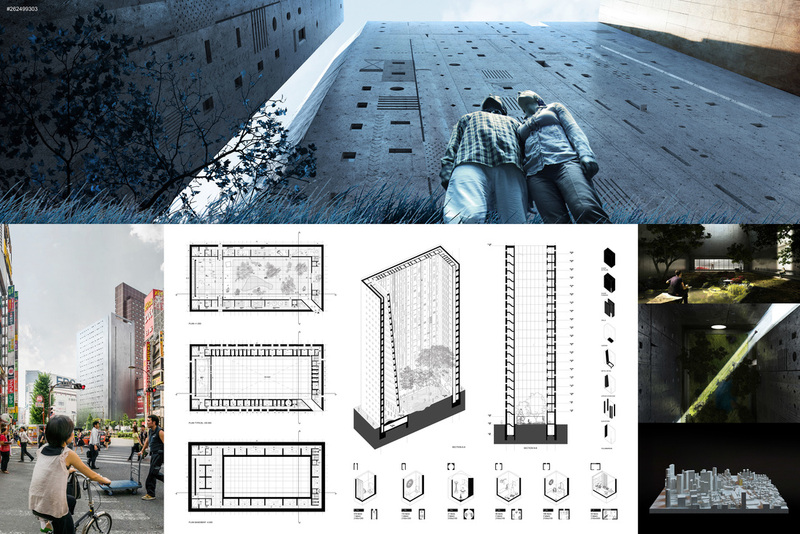 This vertical cemetery reaches downward, accommodating the deceased with efficacy and privacy. 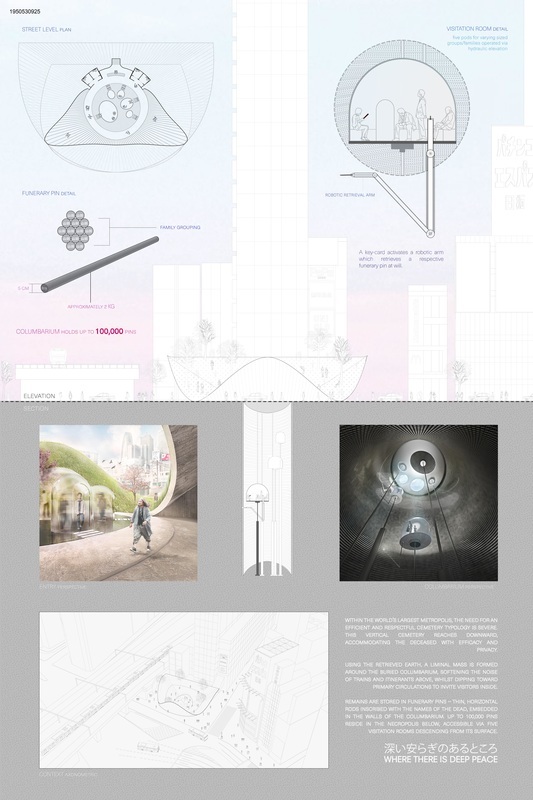 Using the retrieved earth, a liminal mass is formed around the buried columbarium, softening the noise of trains and itinerants above, whilst dipping toward primary circulations to invite visitors inside. Remains are stored in funerary pins – thin, horizontal rods inscribed with the names of the dead, embedded in the walls of the columbarium. Up to 100,000 pins reside in the necropolis below, accessible via five visitation rooms descending from its surface. Every five minutes somebody dies in Tokyo. 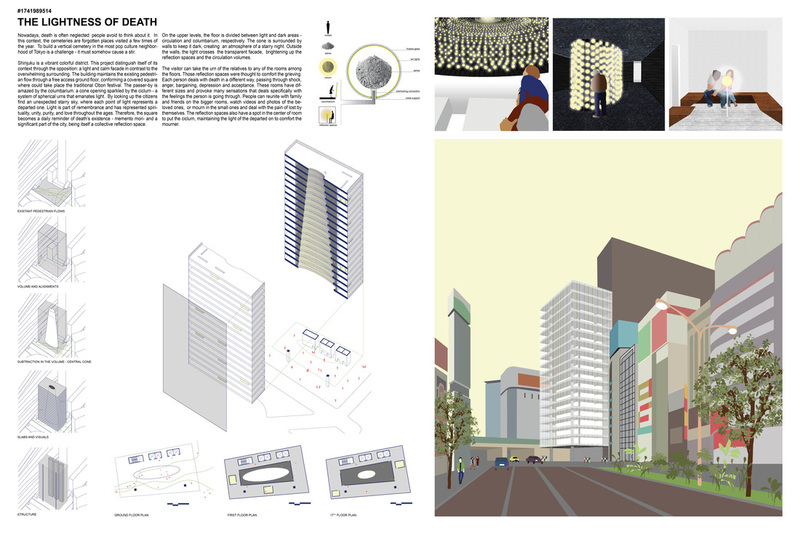 Due to new technologies the building works like a database reporting in real-time every death in the megacity. Relatives and friends can go to the building to watch pictures and videos for remember their loved ones. Although, urns could be located in a huge columbarium, the goal is that people can spread the ashes into a large well, that symbolizes acceptance and healing. The building seems have been there from ancient times as a megalith that contrasts with its surroundings We die when people forget us. Life is a journey, so is death. Death is a journey of reflection and memory of your loved ones. Death is fragile, but loud. It brings out one’s deepest emotion and thought that can never be heard as the body is already consigned to the grave. Can funeral happens before death such that the deceased to be and their loved ones can both engage in the journey of death? Reference to the ancient Japanese ritual, seizenso, a living funeral that celebrates life can happen multiple times in one’s life. Death is not the end, but a threshold. The project brings closer the death to the living by creating an unexpected way to deal with mortality. The pedestrian, who can freely move on the open ground floor, is amazed by the columbarium: a cone opening sparkled by the ciclurn - a spherical urns that emanates light. This collective reflection space of the death deals with it in a light and beautiful way, connecting the viewer to the idea of memento mori. 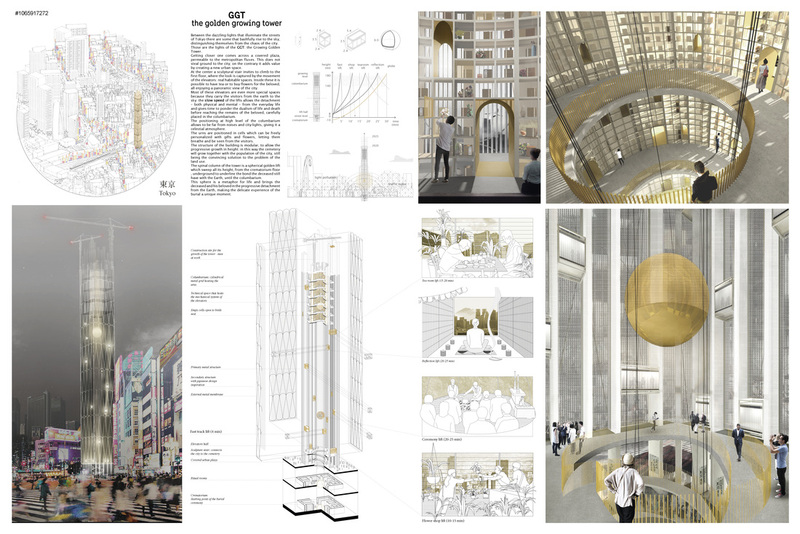 On the upper levels, the floor is divided between light and dark areas - circulation and columbarium, respectively- with private reflection spaces spread along the light area. 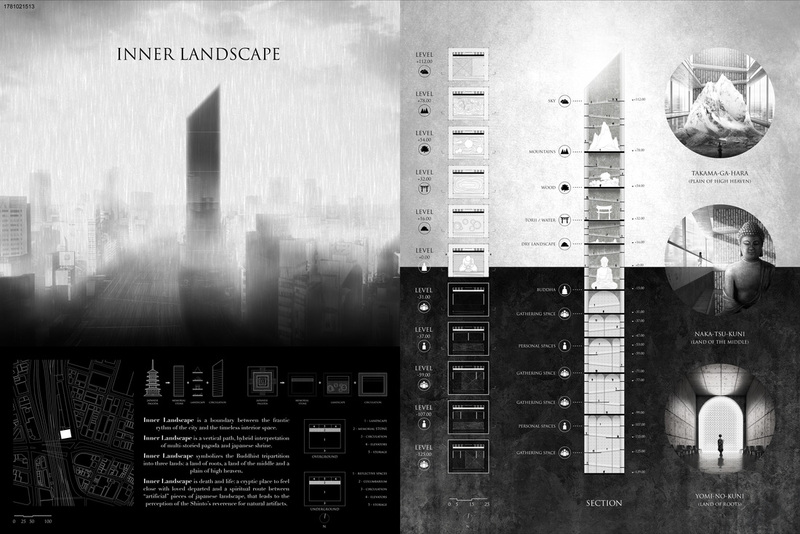 Dynamic and vivid structure of vertical cemetery is opposed to the static and frozen idea of death. The columbarium is embodied in bamboo-like vertical tubes that are moving with the wind, sound like dripping water and feel like garden. The structure is made of hexagon net build up as a spiral to keep it firm and stable, and the carbon fibre reinforced plastic allows it to be lightweight. Each of 15 tubes contains 3870 urns with ashes and the spiral rail carriage transfers each of them to the reflection space in the basement slab.